The begonia plant includes over 900 species, with a wide range of flower colors including white, pink, orange, yellow, red, and salmon. Begonias that are grown indoors as houseplants are warm-natured, and generally originate from tropical regions. All begonias have fleshy stems and uneven leaves – one half of the leaf is usually longer than the other. The shape of the leaves vary. Begonia leaves can be rounded with scalloped edges, elongated hearts, or ivy shaped forms. Flowers are either male or female. Female flowers (a home for seedpods) last for weeks, while male blooms are usually short-lived. Begonia plants vary in size and longevity, as well as leaf and flower shape. According to The American Begonia Society (ABS), begonias can be classified into several different categories. The most well-known cane begonia is the Angel Wing species. They come in many varieties, such as large upright plants or types are grown in hanging baskets. All of these hybrids have the pointed leaf shapes that resemble wings. Angel Wing begonias are popular houseplants due their attractive leaves and colorful flowers. They are long-lived and can be propagated easily by rooting stem cuttings. The shrub type ranges in size from miniatures to giants that can reach twelve feet tall. Large varieties have leaves that can grow up to twenty-four inches long in ideal conditions. The leaf surface texture varies - some have smooth shiny leaves; other types have hairy or felted leaves. Rhizomatous begonias are grown for their interesting leaves, compact growth, and massive display of flowers. The flowers typically bloom in the spring, covering whole plant; however, there are a few cultivars that bloom throughout the year. They range in size, from miniature to larger plants like B. 'Freddie', which can have three foot leaves under ideal growing conditions. Semperfloren begonias are one of the most widely grown. They are commonly referred to as Wax Begonias. Wax Begonias are known for their round, thick, waxy leaves – giving this colorful flowering plant its common name. 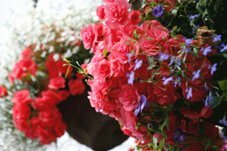 They can be displayed in containers or hanging baskets. In the landscape, they can be planted as a border or mass planting. Rex begonias are a type of rhizomatous begonia that are grown for their multicolored leaves. Rex Begonias are harder to grow than other cultivars; however, their unique stained-glass leaves make a striking display. Their large leaves are marked with dramatic colors, such as pink, green, silver and burgundy. These types of begonias are known for their trailing habit. They put on an amazing display of flowers, typically in the spring. Some of the new hybrids have longer blooming periods. Some species have glossy leaves and look like philodendron, while others are climbers with large leaves. In their native habitat, these types will climb up the trunks of trees. Most of the trailing types have flowers that are white or pink in color. Begonias are sensitive to changes in their environment. It is best to buy begonias from a local nursery. If the plant must be shipped, warm weather conditions are preferable. When you bring begonia plants home, protect them from drafts and dry conditions by enclosing them in a loose plastic bag for the first few days. Handling begonias with care in the first few weeks can improve longevity. Begonias can be propagated by setting stem tip cuttings to root in a warm, humid environment. Some species can be grown from seed; however, the easiest method is by rooting stem cuttings or leaves. 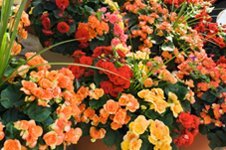 To avoid problems with overwatering and root rot, do not plant begonias in larger containers. Begonias can suffer from over-watering, as well as extremely dry soil. A general rule of thumb is to allow the top inch of soil to become almost dry between watering; however, water requirements will vary by species. Begonias need moderate to dry humidity. You can place begonias on a tray of pebbles filled with water or place them near a humidifier. Note: Begonia care requirements can vary, depending on the species. Be sure to review the requirements that are specific to your plant.